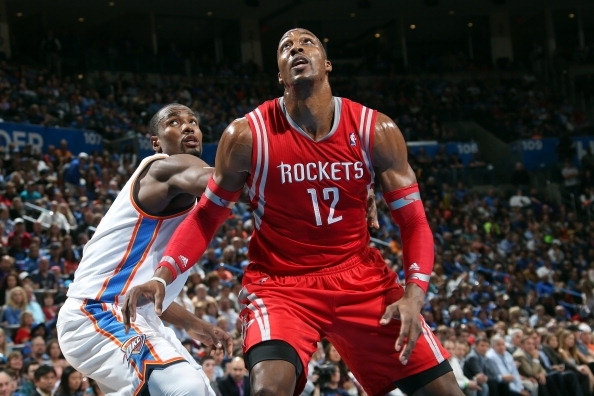 Slowly but surely, Dwight Howard is looking like his old self. You couldn’t alway say that last year when he was in L.A., following his back surgery the year prior. But now, he has another setback, albeit minor. Dwight had a cyst removed from his ankle and will miss at least one game. Fear not, Rockets fans. This shouldn’t impact him or the team come playoff time. Rockets center Dwight Howard, out for the first time since joining the Rockets, said he had a portion of a cyst and fluid drained from his strained left ankle on Tuesday. The Rockets had announced that Howard had an MRI performed on Tuesday, but Howard added that a procedure was performed to alleviate the pain he has felt for about 2 ½ weeks. The Rockets have listed Howard as “day-to-day,” but apparently Thursday is not one of those days. Howard said he will be out against the Timberwolves on Thursday and hopes to return on Saturday in Cleveland. Rockets coach Kevin McHale had said he is very doubtful that Howard will play on Thursday.